Yesterday, Gawker reported the horrifying story of a family that moved the hell out of their $1.3M New Jersey home after receiving countless threatening packages from a person known only as The Watcher. The full lawsuit is the stuff of recurring nightmares, and I’m desperate to find out the person’s identity. 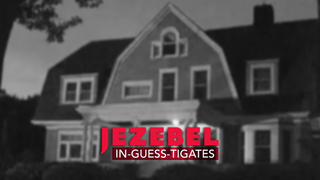 As Jezebel’s Chief In-guess-tigator, I’ve rounded up a few of the most likely suspects. The Watcher has been watching “for the better part of two decades now,” but the current pair of eyes wasn’t the first. Their “grandfather watched the house in the 1920s” and their “father watched the house in the 1960s.” Because watching requires commitment, I’m going to assume they’ve all been locals, so we’re talking about a person whose family has been living in the tri-state area for three generations. Whose family has been living in the tri-state area for three generations? You guessed it: Amy Schumer’s. Over the past few years, she has skyrocketed from struggling comedian to internationally successful superstar known for her biting social commentary. But no one can be that funny all the time, right? Right. Schumer needs a release. A time to not only get away from comedy, but to thrust herself into the complete opposite: terror. When she’s not making the world laugh, I believe it’s entirely possible she’s making the residents of 657 Boulevard scream. Much like Schumer, Meryl’s family has been living in and around New Jersey for generations. Meryl Streep is smart enough to do it without being suspicious, and respected enough to be the last person anyone would ever suspect - anyone but Jezebel’s Chief In-guess-tigator, that is. She’s famous for giving herself fully to every character she plays, but I believe it’s more than possible that her greatest role is that of the nightmare-inducing Watcher. She won’t win an Oscar for that performance. And, if she’s lucky, she won’t even get caught. What if he just can’t get enough satisfaction from EDM concerts, his many girlfriends, or video games? What if he needs another way to find release? Easy - he uses the same method his father and grandfather used before him: scaring the bejeezus out of New Jersyans. That’s the fault in his stars. But wait. Hold on just a second. What if The Watcher was lying about the whole father/grandfather thing - you know, to throw us all off the scent? What if they have no ties to the New Jersey area? Hmmmm, now the net has widened, and I think Gigi Hadid is about to get stuck in it. Her father is a famous businessman, her mother is a famous model and reality TV star, her stepfather is a famous producer, so how do you think she feels when she wakes up in the morning? INADEQUATE. UNDERAPPRECIATED. I believe Gigi Hadid is capable of channelling her insecurity into crime. I can picture David Foster sitting her down one day many years ago and saying, “What’re you gonna do with your life? How will you make a name for yourself and not just live off your family?” I think we might all know the answer to that now. Shia, Shia, Shia. The man loves attention, but he also REALLY hates it! Doesn’t that sound like the disposition of a person who would anonymously stalk a family for years? I thought so too. The act itself thrills you and affects others, but because its done under a pseudonym (in this case, The Watcher) no one has to be all up in your personal business! It’s perfect for someone like him, and I wouldn’t be surprised if he’s gone bicoastal. After all, he does performance art in NY and LA, so why wouldn’t he do his watching from both coasts, too? Shia LeBeouf - former child star/actor/performance artist/rat-tail haver/dancer/music video star/Watcher? It’s possible. Do you trust them? I don’t. This one’s a stretch, but please bear with me. You know that creepy guy who lives across the street from 657 Boulevard who’s always slowly raking the front lawn with a big scary smile on his face even though there are no leaves on it, looking through his window with binoculars at all hours of the night, kidnapping neighborhood dogs and releasing them alive but somehow...changed, doing loud experiments in his basement, dragging can after can of foul-smelling and oddly shaped garbage to his curb every Tuesday and Thursday, leaving flaming bags of poop on everyone’s doorsteps, and threatening to kill you when you pass by during your morning run? Yeah, I think it might be him. He’s my #2 suspect after Ansel Elgort..
Rita Ora is beautiful, has a great voice, and goes to nearly every event where there will be more than one camera, but she just can’t seem to catch a break in the United States. Because her singles won’t top the Billboard charts, I suspect she’s devised other ways to make headlines. If, in a few months, the detectives in charge of this investigation hold a press conference and announce their primary suspect as the Fifty Shades of Grey star, none of us should be surprised. She’s been right there all along. Smiling at us. Trying to get us to remember her name. But Rita Ora didn’t work. No, she needed a new name. A better one. A name like...The Watcher.